Lightning discharges in the atmosphere are familiar, but what about the ones underground? The electrical phenomenon we call lightning is not well understood. The most common interpretation involves the circulation of water vapor up and down through clouds in a process called convection. Water is heated by the Sun until it evaporates, rising into the air where it collects into clouds. The water vapor continues to rise higher and higher, finally cooling enough to condense back into liquid. Earth's gravity then pulls it back to the surface where the cycle repeats. According to consensus opinions, water droplets tend to collide during convection, knocking electrons off one another, creating a charge separation. Electrons accumulate in the lower portion of the cloud, where it acquires a negative charge. As the droplets that have lost an electron continue to rise, they carry a positive charge into the top of the cloud. The regions of charge differential, or charge separation, cause an electric field to form between them, with a strength directly proportional to the amount of charge in the cloud. The electric field can become so powerful that it repels electrons in the Earth's surface, forcing it to become positively charged. A conductive pathway between the two regions can initiate a lighting leader stroke that eventually connects with some positive streamer rising from the ground. 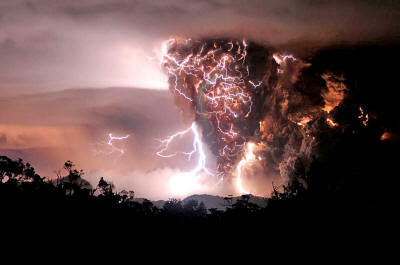 Such a process cannot explain volcanic lightning. Most planetary scientists assume that the cause is similar, but there is no experimental evidence to confirm the idea. Over the last two hundred years of reporting, lightning has been seen in the ash clouds spewing from numerous volcanic eruptions. Gigantic branching displays were photographed during the Mt. Chaiten eruption in May of 2008 (below image). There were reports of ball lightning bigger than beach balls rolling along the ground when Mt. St. Helens erupted in 1980. 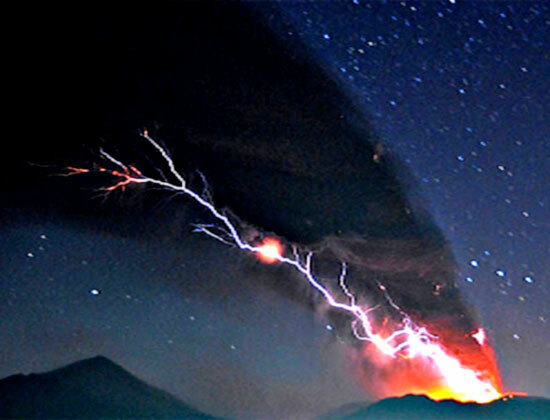 Eyjafjallajökull produced flashes that lit up the sky for many kilometers (below video). Large "telluric currents" have been found circulating through Earth's crust because our magnetic field induces current flow in conductive strata. Thousands of amperes flow beneath the surface, varying according to conductivity. Since the Sun can affect Earth's magnetic field through geomagnetic storms, fluctuations in telluric currents can occur when there is an increase in sunspots or solar flares, because they create oscillations in the ionosphere. Sometimes earthquakes can produce flashes of light and other luminous events, as well. Ball lightning has been reported accompanying earthquakes, as have bright, colorful cloud-like formations floating in the sky above the fractured strata. It is not surprising that glow discharges occur before and after earthquakes: compressing quartz creates a flow of electric current. That is one reason why radio noise can be detected coming from areas under extreme stress. Is that stress only due to compression? Quartz reacts to stress by producing electricity, but when electric current flows through quartz it vibrates with a frequency coincident with the watts of power supplied to it. In a previous Picture of the Day, our planet was compared to a capacitor, capable of being charged and discharged by external electric fields. A capacitor stores electric charge. Capacitors are constructed of two conductors, or "plates," separated by a dielectric insulator. Electric charge on one plate attracts an opposite charge to the other, resulting in an electric field between them. As the capacitor's charge increases, its electric field increases, stressing the insulator's ability to separate opposite charges. If a high enough potential grows between the two conductive plates, the dielectric insulator will fail and the capacitor will short circuit, suddenly releasing the stored energy. It is that phenomenon that most likely contributes to atmospheric lightning discharges. Stored electrical energy in the clouds and in the ground overcome the atmosphere's ability to keep the two charges separate, so they reach out to each other as "leader strokes." When the two lightning leaders meet, a circuit between the clouds and the ground (or between one cloud and another) is completed and a burst of electric current flashes along the conductive pathway. Since magma can be considered a form of liquid plasma, it can also conduct electricity. As the ionosphere is charged up by solar flares, opposite charge is attracted to subterranean magma. Electric currents in plasma pinch down into filaments and form double layers. Electromagnetic forces between current filaments and between double layers can cause sudden pressure variations. If, as stated above, the charge differential between layers becomes too great, a double layer can explode, releasing all of its energy flow instantaneously. So, earthquakes can be considered a form of underground lightning. If there is a break in the strata, permitting magma to reach the surface, the arc discharge might connect to the outside and a lightning bolt will leap from the cone of a volcano. If earthquakes are underground lightning bolts, then perhaps seismic waves are the thunderclaps. In that case, it seems likely that the majority of energy release during an earthquake is not from the fracturing and movement of rock strata, but is the result of electrical energy detonating within the matrix.